Sam Flores first caught our attention via magnolius on Tumblr. Originally from New Mexico and currently based in San Francisco, Flores creates characters which are hero-like. His signatures are that these characters have mostly closed eyes and large hands. The end results is the feeling that these characters are expressing a particular dichotomy in life – simultaneously experiencing ugliness and beauty. Like most teens of the late 80’s and early 90’s, Sam was involved in street cultures of skateboarding and graffiti writing. From 1995-1998, these roots in urban expression helped him land freelance gigs doing graphics for Adrenalin skateboards and Civilian clothing. He’s shown at Virgin 69, 5024, and Hotel Biron galleries, as well as traveling shows to New York, Canada, Singapore, Tokyo and throughout Europe. His focal medium is paint on maps, blue prints and canvas. These paintings touch classic themes of “natural beauty,” which is in obvious contrast to his life in the urban landscape. His figures tend to be somewhat anonymous, even masked in some instances, yet still full of personality and emotion. An art school evacuee and self-taught illustrator, Flores has established his place in the modern art movement as a master of fine art and product design. His contemporaries include Shepard Fairey (OBEY), Mike Giant, Jeremy Fish and David Choe; whose collective bodies of work have forged a pathway for a new accessible movement within the popular art world. Sam Flores’ artistic quality is unpretentious and provocative and demands consideration without categorization. In keeping with the signature styling of his graffiti art background, Flores’ current fine art work carries a voice and vision that is instantly identifiable. The exotic characters and natural landscapes he is known for are at once lush and meticulous. Flores’ signature female Fatima figures are often draped in flowing gowns with oversize welcoming hands gracefully placed upon their laps. Other influences include 19th Century Art Nouveau icon, Alphonse Mucha & American poster artist Derek Hess. Color and contrast are the trademark characteristics of Sam Flores’ artwork. Not unusual, perhaps, for someone who spent the first twenty years of his life immersed in the stark beauty of the New Mexico desert, an environment that has surely informed and influenced his aesthetic sensibilities. 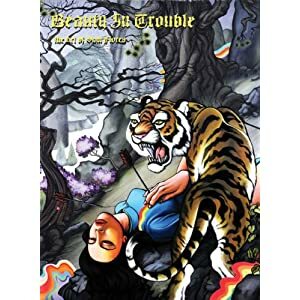 Beauty in Trouble is a career retrospective that shows his talent in evolution from when he started drawing as a kid, through his teen years when he was involved in the street art cultures of skateboarding and graffiti, to his current life as an established artist whose works are exhibited in galleries all over the world. It includes works from his most recent exhibition: Ego, Addiction and Other Bedtime Stories, in which he tackled what is perhaps one of the most pervasive themes in human existence: the eternal struggle between light and dark, between good and bad. Beauty in Trouble showcases Sam Flores’ uniquely unpretentious and provocative style and his ability to demonstrate the potential for beauty to shine through, even in the darkest of hours.